ITALIAN CYCLING JOURNAL: Castelli's Battaglia in Montagna, Ride 813 Kilometers in 14 Days. 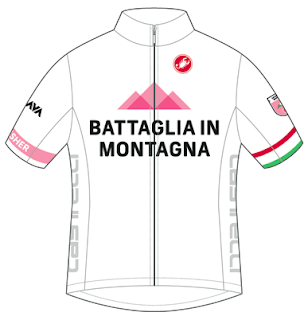 Castelli's Battaglia in Montagna, Ride 813 Kilometers in 14 Days. The Giro d'Italia is a race known for epic mountain battles on climbs like the Passo di Gavia and the Passo di Stelvio. To celebrate this iconic race and its always exciting fight for the Maglia Rosa, Castelli and Strava are challenging you to ride the combined distance of stages 10, 14, 15, 19 and 20 from this year's race. These five stages, all major summit finishes, are where the eventual winner will undoubtedly prove they have what it takes to bring home the Maglia Rosa. 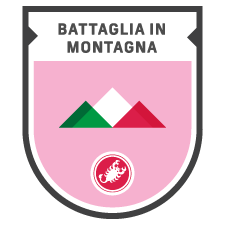 Riders that successfully complete the Challenge will receive a Battaglia in Montagna finishers badge on their dashboard and will have the chance to take home an exclusive jersey produced by Castelli. This jersey will only be available for purchase by Challenge finishers. In addition to the Challenge, Castelli will also be hosting a photo contest on Instagram asking riders to share their Challenge stories. You can learn more by visiting Castelli's website.